Our technical data centre services include structured cabling, equipment racks & accessories, security systems and related data centre technical infrastructure. As data centre experts Workspace Technology is uniquely positioned to provide structured cabling systems as part of our technical data centre services. 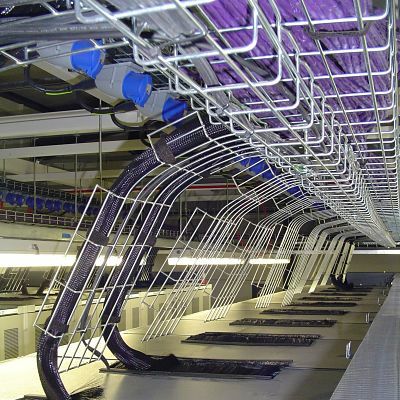 We design scalable data centre cabling infrastructure to support flexible connectivity, future growth and potentially new technologies, providing data centre performance, density and manageability, without compromise. Workspace Technology is a certified cable installer for several leading cable brands and we support a range of Cat6A (10Gig), Cat6 and fibre optical solutions fully compliant with TIA-942 recommended data centre installation practices. Workspace Technology offers a wide choice of high quality enterprise class equipment racks and PDUs as part of our technical data centre services from a range of manufacturers including APC by Schneider Electric. Schneider Electric NetShelter enclosures, open frame racks, and related products provide a complete solution to meet the challenges facing server and networking applications across many environments. A range of rack accessories provide excellent cable management capabilities for high density networking, server and blade applications. Whether it's deploying rack power distribution in a wiring closet, server room or data centre, Workspace Technology's data centre services support a variety of power density applications up to 22kW per PDU. Click here to view our APC Rack PDU brochure. As part of our technical data centre services Workspace Technology integrates Schneider Electric's SmartBunker is a single enclosure and includes all necessary power, cooling, security, and associated management tools (DCIM) to support a single rack Micro Data Centre application. SmartBunkers are ideal solutions for edge environments and feature a range of enclosure designs to address concerns such as sound-proofing and aesthetic panels for office spaces or thermal isolation and dust protection in industrial environments. Workspace Technology offers a wide range of fully customisable SmartBunker options, delivery and positioning, onsite installation services including I.T cabling, power and AC systems as required as well as configuration and management integration services. Click here to view our SmartBunker brochure. As part of any of our data centre services we provide Intruder Detection, Access Control & CCTV systems. We can offer standalone solutions or can be integrated into existing house systems dependant on clients preferences. Physical security is an integral part of data centre Infrastructure because it plays a direct role in maximising system availability. It does this by reducing downtime from accidents or sabotage due to the possibility of unnecessary persons (or those with malicious intent) gaining access. Workspace Technology offers clients with options based on ‘what you have’, ‘what you know’, and ‘who you are’. Systems range from a simple lock and key to computer activated proximity card controllers and pin code devices. Combined with IP Camera monitoring, a flexible approach can be designed to support client demands. For more information on our full range of Technical Data Centre Services please contact our sales team on 0121 354 4894 or send us a message.